Kensington is well known for creating laptop locks that can anchor your portable PC to something sturdy to keep it from getting lost or nicked. Its locks have been so successful, in fact, that if you own a laptop it's very likely that it has a small rectangular slot for attaching a Kensington lock to it. This level of success is certainly impressive - after all not every company has provisions for its products built into most computers. 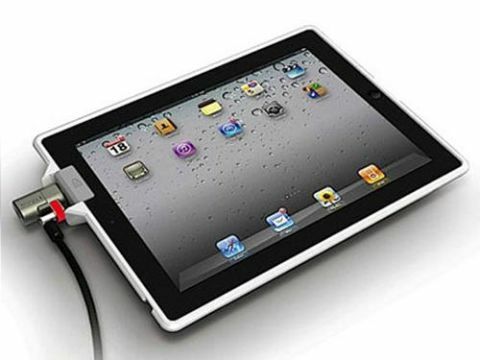 However, this success hasn't translated to the popular tablet, the Apple iPad 2. Apple's uncompromising focus on streamlining features on its flagship tablet has meant there's no room for a Kensington lock slot. With tablets being just as easy to lose or steal - if not more so - than laptops, Kensington has been keen to come up with a solution. Of course, it also wants to capitalise on the iPad's popularity. Its solution, the Kensington SecureBack Security Case, isn't that great, unfortunately. It involves a rather unattractive case that clips on to your iPad. With it installed, the once sleek and attractive Apple tablet looks bulky and a bit ugly. Who knows, maybe making the iPad a less attractive gadget is part of Kensington's plan to deter thieves. But if it keeps your iPad safe, who cares about looks? Well, how well it keeps your iPad protected is a concern. The case itself is rather flimsy and a tiny bit cheap feeling. A determined enough thief wouldn't have much trouble breaking the iPad free. We wouldn't feel completely safe leaving an iPad in a busy café with just the Kensington SecureBack Security Case for security, which makes it pretty much redundant. It may dissuade someone from quickly snatching it, but not much more. It also doesn't come with the ClickSafe Lock to secure it - essential really for securing the iPad. You need to buy it separately, which is an extra expense.